Tart Cherries Canned in Their Own Juice - Let the Baking Begin! Preserving tart cherries through the process of canning is a great way to save them for later use, like when they’re no longer in season :). For some reason, tart cherries are not as popular as I think they should be. Slavics use them in a variety of ways as these cherries grow in abundance back home (which for me is Ukraine). 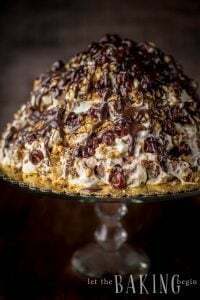 Their tart-sweet taste makes them great in coffee cakes, muffins, cherry vareniki/pierogies as topping for cheesecakes, in cakes (like this Honeycomb Cake with Dulce de Leche Buttercream or this Honeycomb Cake with Chantilly Cream, or even this Flourless Black Forest Chocolate Cake), in pies and even tarts. If you were to buy them at a store, 2-3 cups of preserved cherries will cost you about 7$ – 8$, but canning them yourself will cost you about 2$ for the same amount, so not only are you saving money, but you’re also making sure that your canned goods are artificial preservative free. Some people are really intimidated by the canning process, but it really isn’t anything complicated, as you will see in the step by step photo instructions below. My daughter picked this little bucket of cherries all on her own! I sure was glad to have such a helpful picker! Start the process by thoroughly washing the cherries, then use the cherry pitter or a safety pin to pit your cherries (check this video for ways to pit cherries). Once you’re done pour enough sugar over the cherries to allow them to release their juice. I use about 1 cup of sugar for every 4 cups of pitted cherries. You can use more or less sugar depending on how sweet you want the syrup around the cherries to be. Now you want to mix the cherries with sugar and allow them to sit refrigerated overnight (or up to 2 days). This will allow the cherries to release their juice, which will then be used to submerge the cherries in for canning. When you’re ready to can your cherries, remove them from the fridge and get your jars ready. Thoroughly wash the jars and lids with hot soapy water. Now place a clean jar onto a plate and using a canning funnel scoop up the cherries with the juice and fill the jars. Leave about 1 1/2 inches head space in each jar. Close the jar with a lid, but do not tighten. Now put a clean kitchen towel on the bottom of a large pot (you do not need to do this if you’re using the canning pot with a rack). Put the jars inside the pot and fill the pot with enough water to come up 2/3 up to the lid. Close the pot with a lid and cook until the cherry mixture inside the jars starts to boil. It will take a while so be patient. Cook for about 5-10 minutes from the time the mixture inside the jars starts to boil. You will know that it’s boiling when you see bubbles coming from the bottom of the jar towards the top. Just remove the jar from time to time and look for the bubbles. Once the cherries have cooked, remove the jars to a kitchen towel lined counter, tighten then lids and let them cool completely. You will know if the lids have created a seal when the top of the lids have been sucked inside and when you press on the top of each lid, no popping sound is heard. At this point you’re done, but I usually unscrew the outer ring and wash the jar (with the top being completely sealed to the jar) before I store it away. 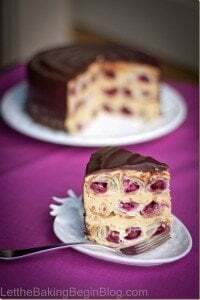 Honeycomb Cherry Cake – Puff pastries filled with cherries, in a sour cream frosting. 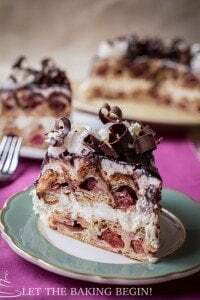 Cherry Chocolate Pavlova Recipe – The best meringue recipe with cherries. Cherry Galette – Simple cherry pies with whipped cream and almond flakes. Now go ahead and share what YOU think these cherries would be good in! 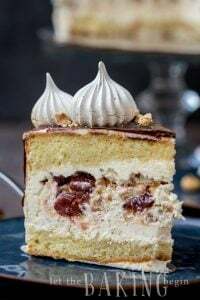 I am 78 yrs old and I love to Bake. I buy my fruits and vegetables fresh from the Farmers. I like to can anfd freeze them. When you use thes canned cherries to make a pie, do you put corn starch in it or does the juice create enough of a syrup from the canning process? When I make a pie I do add a tablespoon or two of cornstarch to the drained cherries to thicken the liquid that will form in the pie. The syrup in the cherries (when they’re canned) is very thin, since there’s definitely not enough sugar to make it thick. Thank you for the reply! Can’t wait to try these! It is almost cherry season here in Michigan! I’m excited! Why cold pack and then boil, rather then bring to boil and hot pack? 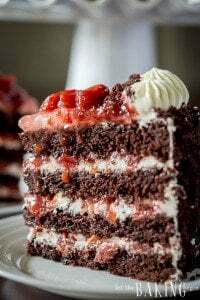 I like the idea of letting the cherries juice, rather then making a syrup and filling with that. Just wondering if it’s a trade of of one less dish, but a bit more time to fill the jars, or if there’s an advantage I am not aware of. As hot as it is, I’d rather wash more dishes and have the water bath boiling for a shorter time! There’s not really a good reason for it, either way it will work. It’s just a matter of personal preference. The only reason why I did it this way is because when you fill jars with hot liquid, there’s a risk of the jars cracking, so you need to use measures to prevent that. Also, for me pouring cold stuff into the jars decreases the chance of burns. That makes sense. Just wanted to be sure there wasn’t something science-y that I was missing! Thank you for this simple tutorial. We’re cherry picking today. I can’t wait to can our haul! I wanna see your haul Jennifer! how long do they last on the shelf?before they go bad. They won’t turn moldy or anything, but I think it is recommended to use them within a year of canning, since they have acid and it tends to start eating away at the lid (metal). You must cover the jars with the water in the canner and bring water up to boil then process for approved processing time. Then leave in cancer five minutes with lid and heat off. Then remove and they will seal. Марина! Доченька твоя така украиночка настоящая helper! !thank you for sharing the tip.God bless.